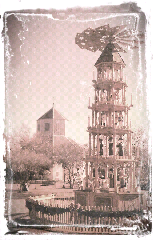 I so enjoyed my last visit to Fredericksburg in 2013 yesterday. This quaint little German town is all decked out for the holidays. Shoppers stroll Main Street. Kids ice skate in the park. It felt like I had walked into a Hallmark Christmas movie. I am excited to be one of five artists participating in Artisans' Tis the Season for Jewels trunk show and demonstrations during First Friday Art Walk Fredericksburg. The gallery will have unique gift wrapping available for jewelry to help create an exceptional gift for someone special. 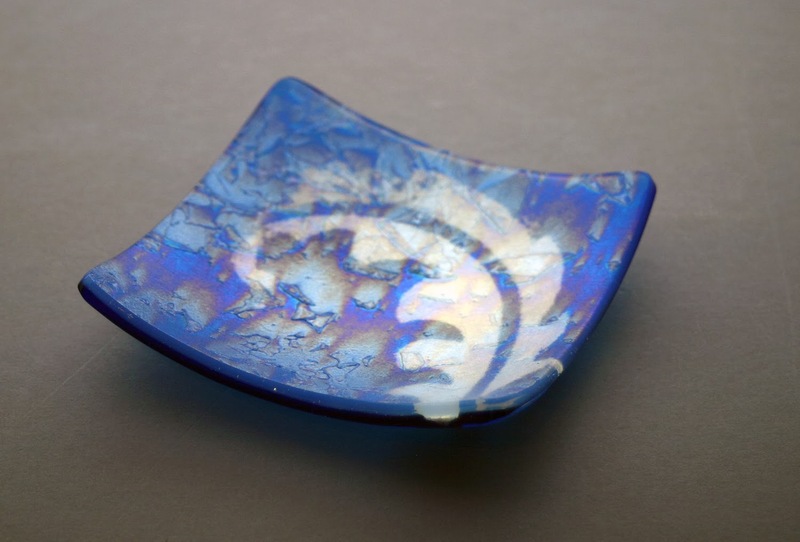 This is a great opportunity to pick up some unique handcrafted holiday gifts. The celebration begins on Friday, December 6, at 11:00am and will close at 6:00pm so that everyone can enjoy the holiday parade on Main Street. Late last week I received a last minute invitation to come offer my glass jewlrey and art work at the 2013 Y O Ranch exotic game sale. 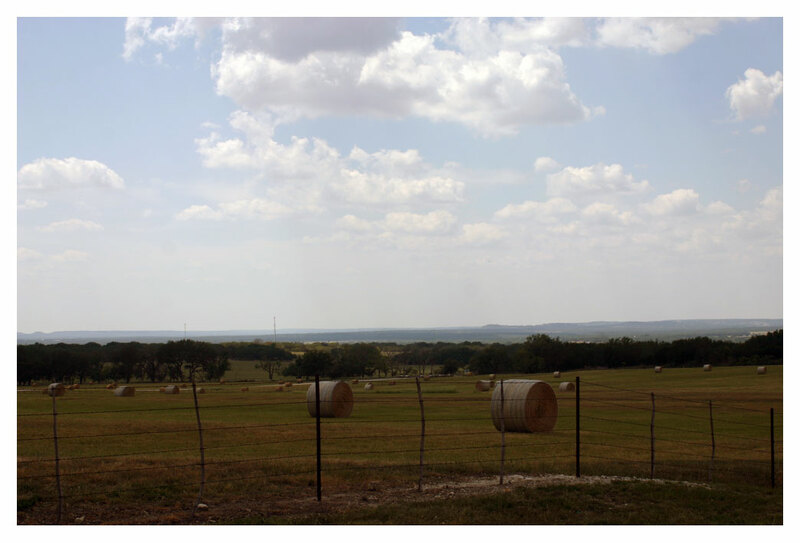 I always love a good drive into the Texas Hill Country and this one ended in 8 miles of unpaved road on the ranch itself. I can't remember the last time I was at a livestock auction and this one was full of beautiful exotic animals. 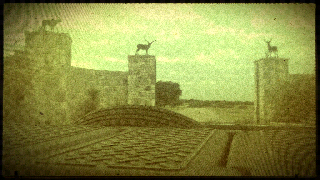 It was an intersting way to spend the day on this historic Texas landmark. Tonight was the San Antonio Calligraphy Guild general meeting and I was exciting to be able to present them with the results of their 2-hour September Mini Workshop. 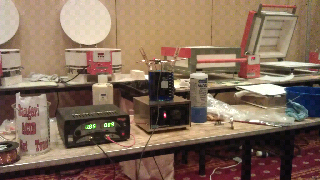 We had so much fun with with just those little butane torches and some 2 mm stringer. 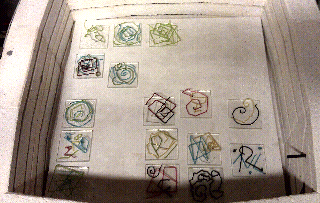 Here are their pieces going into the kiln on the evening of September 19th. And Below that the finished 3" ring and sushi dishes. I'm not sure who had more fun me or them. Great job ladies!!! I am so excited about tonight’s mini workshop with the San Antonio Calligraphy Guild (SACG). 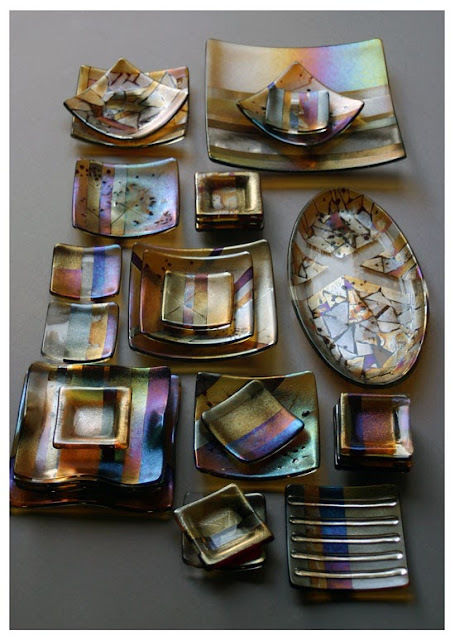 This will be such a fun opportunity for SACG members to try their hand at a different medium. 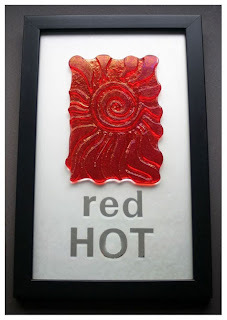 I will be demonstrating how glass can be manipulated in the flame to create spirals and flourishes. We will talk about some basic safety, material and design considerations for working with glass. 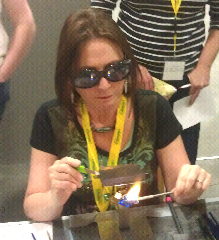 Then using small butane torches members will get to experience bending and shaping 2mm strings of glass in the flame. The mini is both a demonstration and an opportunity for a little hands on experience. 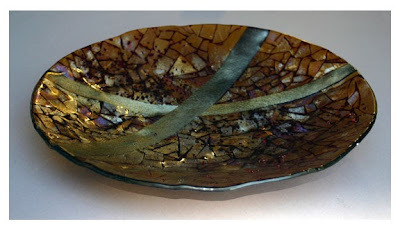 If are interested in more information, you will find a complete tutorial for using a butane torch to bend glass in the San Antonio Glass Art Guild (SAGAG) cookbook. The cookbook includes both recipes and tutorials from members of SAGAG. Proceeds from the cookbook go to support the SAGAG scholarships program. Thank you to Gail at Wired Designs Studio﻿ for providing the butane torches and Sam at Dream Fire Glass for providing the wave mats. These contributions enabled us to have enough stations for all workshop members to get a chance to try this technique for themselves. 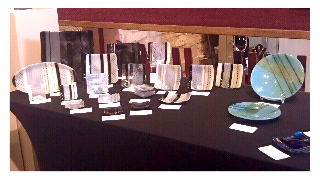 After a few weeks of hard work it's nice to see my effort on display at Artisans at Rocky Hill. I am pleased with how the big bowl turned out. This series was just delivered to Artisans today and is already out on display. 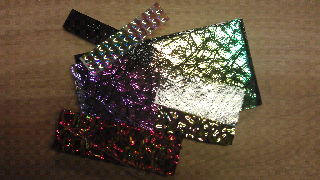 It makes for a very sparkly table. The San Antonio Calligraphy Guild is about to wrap up its' annual summer secrete pal exchange program. 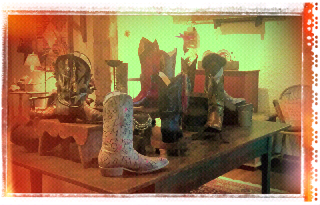 This year's theme was western inspired. Here are examples of the collection of painted and decorated boots being collected from guild artists to be used to decorate the September Program where members will display the items the exchanged throughout the summer. This is always a fun event. 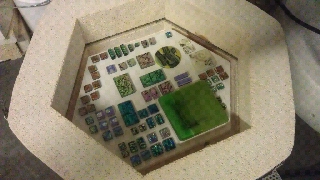 I have been working on more peices in the cross fire series to take to Artisans this Saturday. I had done a couple of kiln loads of plates but wanted to do something with just a little more presence, so I started work on this 20" bowl. Here it is just before its' first firing. 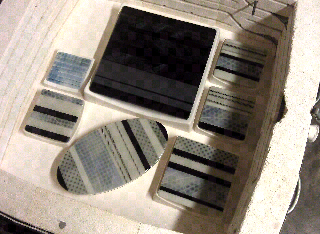 It was cold worked last night and went back into the kiln to take shape. 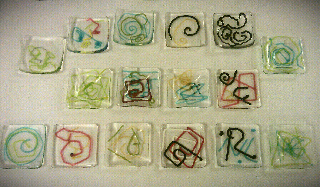 I look forward to taking these peices up to Artisans this Saturday. As we approach the two year anniversary of the Bastrop fires, my heart continues to go out to hose impacted by that tragedy. Working on these peices I recall that September in 2011 when fires dotted across the Bastrop County. I am reminded of the impacts of severe drought, and am grateful for the little bit of rain that fell yesterday. 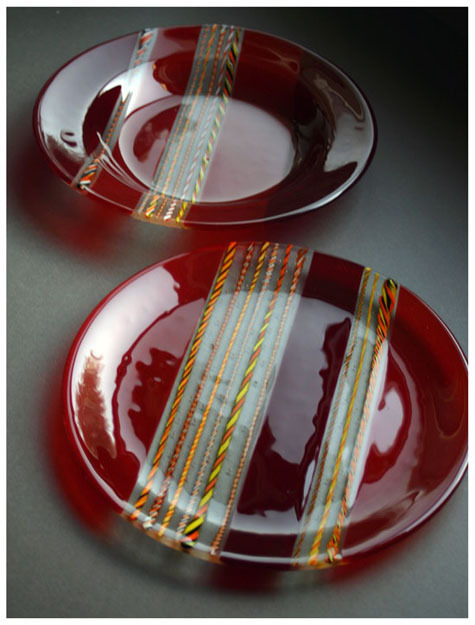 I recently received news that several of my pieces have been excepted into Texas Heat a juried glass exhibition. 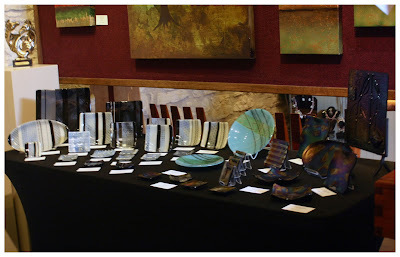 The show is sponsored by the San Antonio Glass Art Guild. 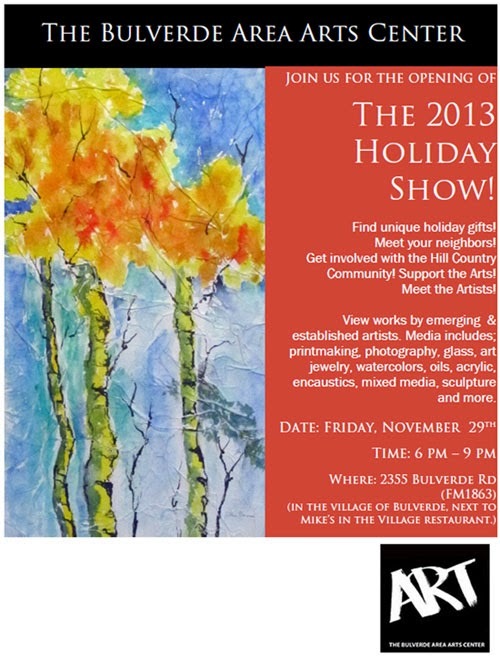 Works will be displayed at the Bulverde Area Art Center from September 6 through October 4, 2013. An opening reception will be held Friday, September 6 from 6-9 pm and is open to the public. This should be one hot show. 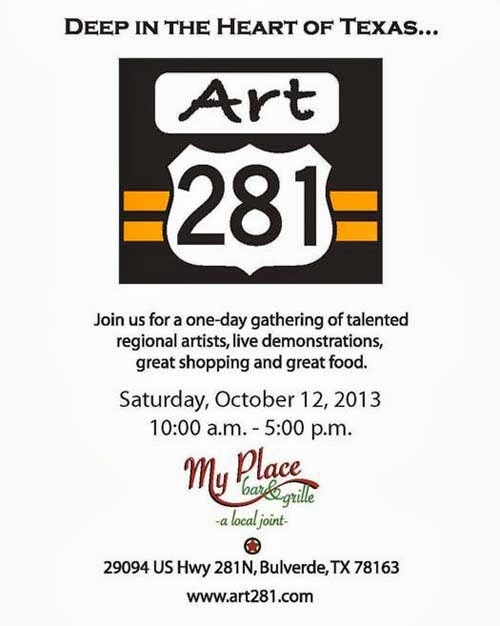 I recently signed up to participate in my 5th ART281 event. Sponsored by the San Antonio Glass Art Guild, Art281 is a juried showcase for hand-made art and fine craft of all mediums. Located at My Place Bar & Grille in Bulverde, Texas, the event is ideally situated on Hwy 281 North between San Antonio and Bulverde, in the foothills of the beautiful Texas Hill Country. There are still indoor and outdoor spaces available but you must sign up quickly to be included in the event show book. For more information visit www.art281.com. I realize it has been a while since I last posted. Here are a few things, in no particular order, that have happened in the mean time. 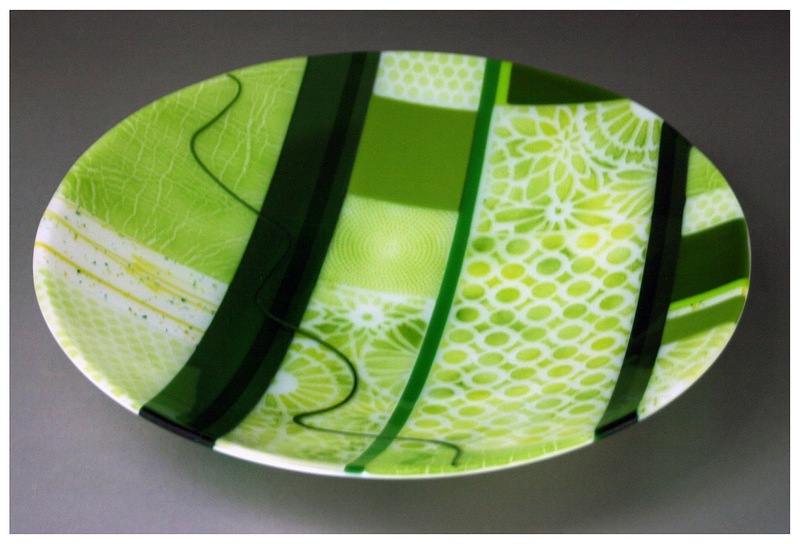 Granny Smith a 21inch vibrant glass bowl sold in July. 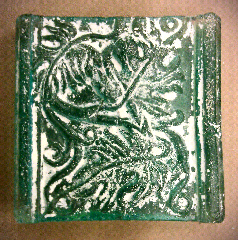 Finally finished a kiln carving that started over a year ago as a class demo. Explored alternative routes on my monthly drive to Fredricksburg. Finished work on a bathroom redesign with a few glass touches. including Morning Commute and Northern Lights. 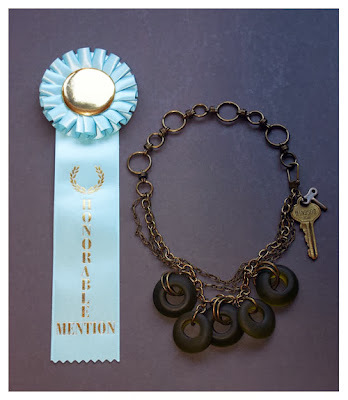 Entered three pieces in the juried exhibition Texas Heat. This meeting will take place at Val's barn. The address and a map were included in the SAGAG News & Announcement email. If you did not receive this email or need assistance, please contact info@saglassguild.com. • Margaritas and snacks, yum. • Annual Election - Put the right people in the right jobs to help SAGAG. • Yearly Membership Renewal - Members paying by cash or check at this meeting will be eligible for a drawing for a free membership. • Volunteer of the Year Award - We have members that do so much for this organization. Let's take time to acknowledge a few of them. • Door Prizes - Yes, you have a chance to win cool prizes just by showing up. • Raffle - Increase your odds of walking away with a prize by participating in the raffle. Proceeds benefit SAGAG. • Art281 - Sign up for the SAGAG's fall event. 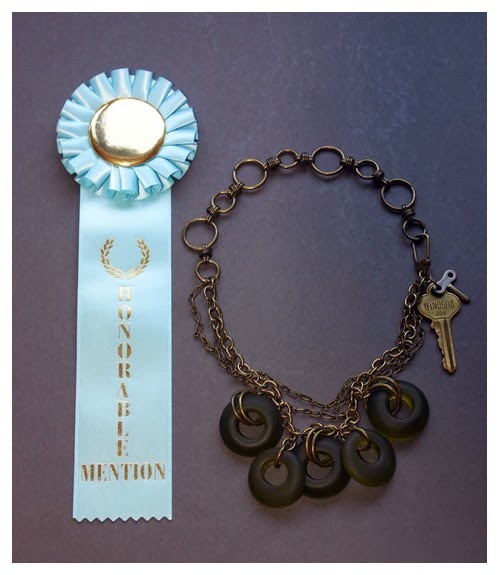 • Get the low-down on a new juried Art Show. 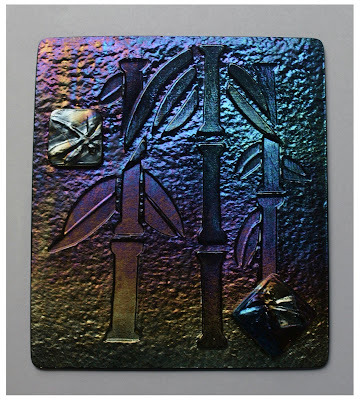 • There will be a presentation by SAGAG scholarship recipient Anne Burtt. · Find out what programs the SAGAG has in store for the rest of 2013. • AND a surprise gift for all attending members! I learned Saturday this bowl had sold. A bit of sunshine in an otherwise gray and rainy day. Warm yellows, orange and reds in a patchwork of color centered around a glass weave would brighten just about any ones day. 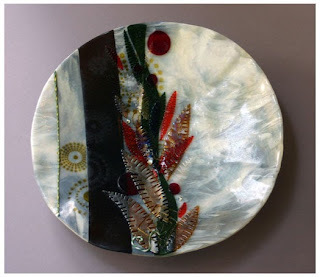 This piece is tactile and decorative. An enjoyable piece to make and hopefully own. After stretching myself to work in bright colors for a little while I am returning to a color pallet that comes more natural to me. I think this series suits the world around me at present; wet rainy days, morning commutes to work and ever expanding urban sprawl. I was still hard at work on these pieces during the heavy rains this weekend that lead to a minor flood in my home studio. An opportunity to clean and organize I kept telling myself. Other then a bag of plaster there was very little lost. Despite the craziness, I was still able to complete this series in time for my trip to Fredricksburg. A beautiful Memorial Day Monday made for a great visit to Artisans of Rocky Hill. The town was full of visitors enjoying the Nimitz Museum in honor of the Holiday. 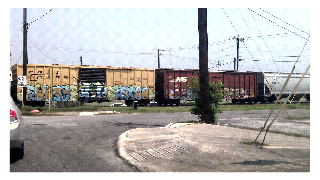 Cleo and I were on our way home from her veterinary appointment Saturday when we were stopped by a passing train. My first reaction was to curse the waste if time as I quickly went through the mental checklist of what I had yet to accomplish. It wasn't long before I recognized I needed to change my perspective and enjoy the travelling exhibit before me for this brief window of time. I was recently in Carmel, Indiana. While there I had the privilege of walking through the pleasant little art district on Main street. A combination of new and existing buildings house local restaurants, shops and galleries. Peeking through gallery windows I saw blown glass, raku pottery and encaustic paintings. It was a brief visit but I made a mental note to return if the opportunity presents. Last weekend seven artists from around Texas came together at Wired Designs Studio for a 2 day casting workshop. 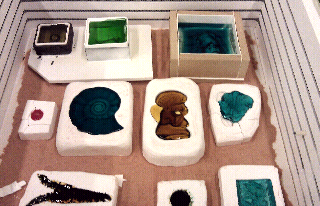 They rolled up there sleves and got a little dirty working with clay, alginate, wax and plaster making molds to cast glass. I had a great time working with this group of ladies. We may have been working with the same materials yet everyone had such differnt results. 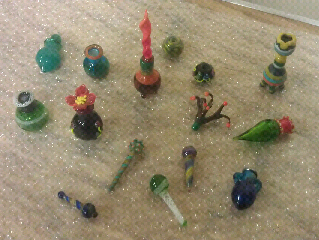 Here are their peices just coming out of the kiln. 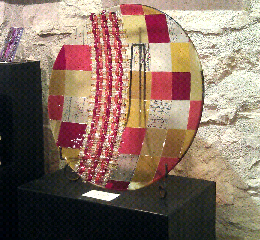 Some choose to work in the positive creating three dementional pieces like this releif Louise created. 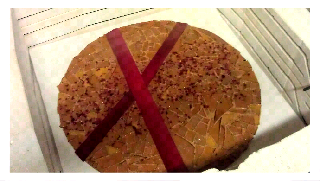 It's still covered in paster and I already think it is beautiful evoking the feel of an ancient roman remain. 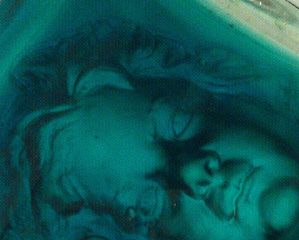 Others used the molds they created to cast negative images in the glass, like this ghostly image Jan created. Tonight is the culmination of the SAY SI Small Scale Work For a Larger Cause exhibit. The event includes a silent auction, live music and inspiring cuisine from some of San Antonio’s top chefs. More than 200 local, regional and national artist participant including yours truly. The event helps raise funds for SAY Sí’s tuition-free programs with 100% of proceeds going to supporting student programming. It's a great cause. Check out the online catalog of work being auctioned tonight. The piece I exhibited at the San Antonio Calligraphy Guild Fall Exhibit will be included in this year's Small Scale auction. The event is from 7pm to 10pm with bid times at 8:30 and 9:15. Enjoying a beautiful day in the Texas Hill Country. 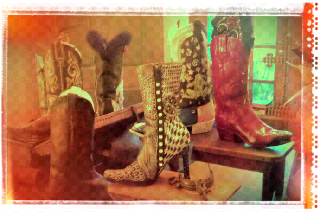 I always love my visits to Artisans of Rocky Hill. 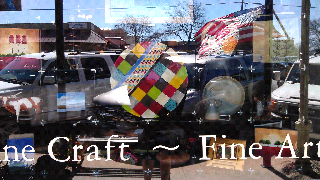 Especially when I walk up to see one of my big bowls in the front Window. Today is particularly exciting with lots of traffic and artists bring new work.